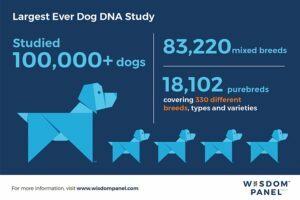 Wisdom Health, in collaboration with Genoscoper Laboratories, conducted an innovative study that shows genetic testing may predict if a dog is at risk for developing certain diseases. The study, published in PLOS Genetics, examined the DNA of more than 100,000 dogs, including 18,000 purebreds representing 330 breeds, types and varieties and 83,000 mixed breed dogs for the presence of 152 genetic disease mutations these breeds are most likely to develop. In addition, the study also revealed that in comparison to purebreds, fewer mixed breed dogs were affected by the most common disease-causing mutations. All of these findings were based on genetic testing technology that can be used at home. The study revealed 2 key results: (1) Approximately 2 out of 100 mixed breed dogs are at risk of becoming affected and 40 out of 100 are carriers for at least one of the diseases; and (2) approximately 5 out of 100 purebred dogs are at risk of becoming affected and 28 out of 100 are carriers for at least 1 of the diseases.